Date: Sunday March 4th, 2012. Summary: Techniques like photography, sculpture, and litography, come together for a noble cause. Photography: art by Isidro Con Wong. Title: “Llena de Color la Vida de un Niño”. Date: Saturday March 3rd, 2012. 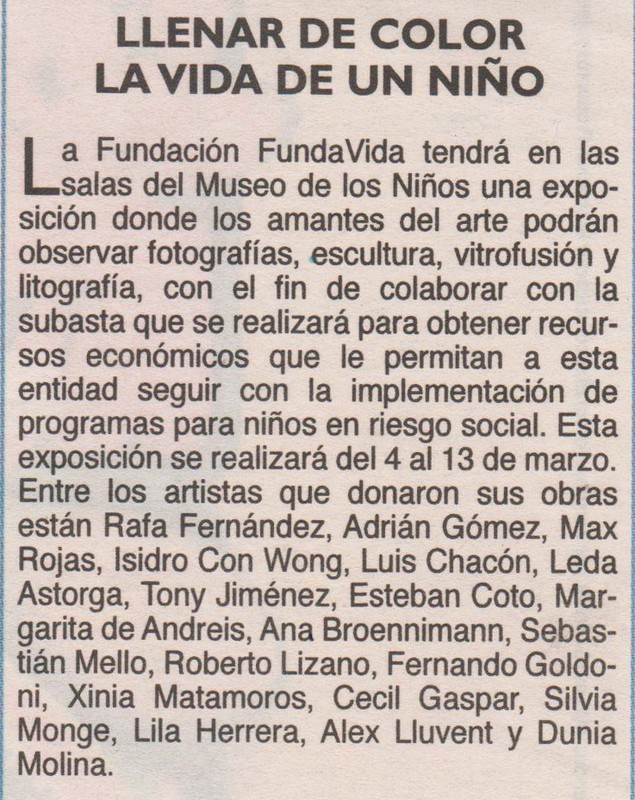 Summary: FundaVida will hold an art exhibit in the Museo de los Niños where art lovers will be able to observe the photography, sculpture and litography with the objective to contribute with the art auction that will be held to raise funds for the programs that help children in at-risk communities. Title: “Dele una mano a los más chicos”. Summary: In the homes of hundreds of children poverty reigns, FundaVida aims to give them the tools for a future with hope. Date: Friday March 2nd, 2012. Summry: Exhibit will be held from Sunday until the 13 of March 2012. Title: “Museo de los Niños se llena de arte”. Summary: Children and adults will be able to appreciate more than 40 art pieces from renown artists. 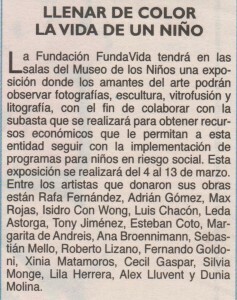 These will be exhibited this Sunday in the Museo del Niño with the support of FundaVida. Photography : Girl watching art. Title: “Artistas donan obras para bien social”. Date: Monday March 5th, 2012. Summary: Renown national and international artists like Rafa Fernández, Adrián Gómez, Max Rojas, Xinia Matamoros y Dunia Molina, among others, have donated their art to contribute with FundaVida. More than 40 artists have donated 100% of their pieces for FundaVida’s project “Llena de color el futuro de un niño”. Photography : piece by Max Rojas. Media: Canal 11, Noticiario NC 11. Title: “Llena de color el Futuro de un Niño”. Section: Agenda del Fin de Semana. Summary: The exhibit in the museum was mentioned as well as the donations made by the artist for the noble cause. Date: Thursday March 8th, 2012. Summary: Art Exhibit “Llena de Color el Futuro de un Niño” in the Museo de los Niños until March 13th. 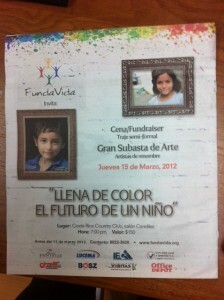 Summary: Information about the art exhibit and FundaVida’s art auction that will be held on March 15th, 2012. Media: Buen Día de Canal 7. Summary: Information about art exhibit and art auction. Interview: Sebastián Mello, Gallery Director. Summary: Interview about the work done by FundaVida in the at-risk communities of San Jose and an invitation to the gala fundraising dinner. 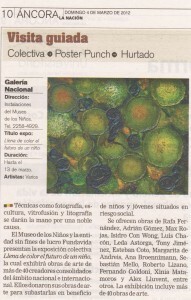 Program: Revista Matutina ADN Hoy. Media: Periódico La Nación. Revista “Somos Célebres”. Date: Thursay March 22nd, 2012. Date: Monday March 26th, 2012. Summary: Story of Ángel, a girl from Patarrá that participates in FundaVida’s Robotics program. 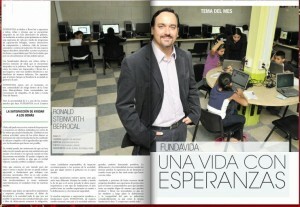 Also mention of the work that FundaVida has been doing in the last 15 years. Summary: Note about the work of FundaVida in the at-risk communities of San Jose since it was founded 15 years ago. Summary: Note about the work of FundaVida in the at-risk communities of San Jose since it was founded 15 years ago and contact information for donations.